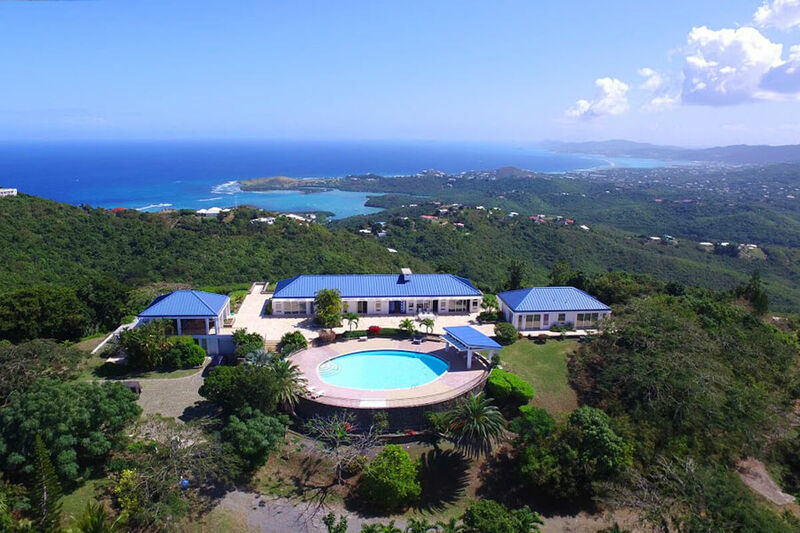 This six-bedroom Clairmont Overlook Villa is absolutely perfect for large family getaways, employee retreats, or for a group of friends looking to spend some time in St. Croix. It’s right on Salt River and is surrounded by a lush landscape with the coastline in sight, so privacy and serenity is all yours, plus every single view is to die for. The villa is actually divided up into three buildings: the main villa with the master bedroom and en-suite bath, a dining room, living room, and kitchen; a guest villa with three king-sized rooms and en-suite baths; and finally a lower apartment with two king-sized rooms/en-suite baths and a studio kitchen. The Clairmont has tons of outside seating on balconies, patios and a pavilion, but there are so many large windows to the house that the scenery from any seat inside is just as amazing. The kitchen comes fully equipped, and the living room has a great media and entertainment center. Oh, and did I mention the onsite saltwater pool? And for even more entertainment, the beach, restaurants and nightlife are a simple 15-minute car ride away! Atop a lush hill of St. Croix, Clairmont Overlook is the ultimate Caribbean getaway offering sun, sand, and sea in a luxurious private villa. Just 15 minutes away from the beach, restaurants and nightlife, Clairmont Overlook is the ultimate location for a couples’ retreat, a relaxing family vacation, or a dream Honeymoon. Boasting stunning 360 views, a main house, guest house, and a fully equipped outdoor gazebo, Clairmont Overlook offers luxury, serenity, and island living. It is directly by Salt River with Christiansted and Buck Island to the east and Cane Bay, Hamm’s Bluff, Mt. Eagle and the South Shore to the west. Totally private, this home has been outfitted with walls of glass windows and doors so that the views can be enjoyed from absolutely every interior location. Over 11,000 square feet of coral stone patio provides outdoor living and entertaining space. There is a separate pavilion with a unique mahogany-topped bar that is perfect for lounging, dining, and serving and has a sensational saltwater elliptical pool right alongside it. The spacious living, dining, and kitchen areas allows the tropical breeze to flow freely throughout the villa. The 3 bedroom guest villa is equipped with king sized beds, en-suite baths, and separate entrances. The lower apartment has 2 bedrooms/2baths with king beds, a studio kitchen, and a private balcony. This 6 bedroom, 6.5 bathroom villa features a fully equipped kitchen complete with a grill, a four ring stove, a blender, a coffee grinder, a microwave, a washing machine, a clothes dryer, a dish washer, cooking utensils, a toaster, an iron and board, an ice maker, and a fridge. There is also a dining room with seating for eight guests. The living room provides comfy seating for 14 has a DVD player, a CD player, a satellite TV, a radio, books, a stereo system, internet access, wireless broadband and a media center. Villa is five star. WiFi is very intermittent if that is important to you. Also lots of wasps so take lotion. Pool is very large and outdoor space awesome. Shawna and WhereToStay were excellent!